This is a great insight into a troubling topic that is the hiring process. If you need to beat the rigged system,check out this book. Give the good ol boy system a slap in the face! Are you weary of the same old thing on your journey to your career? 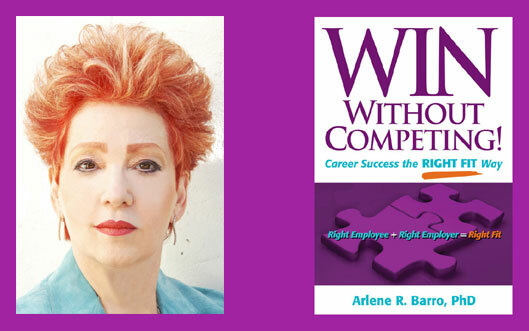 Whether you're unemployed, underemployed or looking for new challenges, "WIN Without Competing!," authored by educational psychologist Dr. Arlene Barro, may be the key to your professional and personal success. "WIN Without Competing!" is a valuable resource book that provides a much needed service to the reader. It is a step by step process in which the candidate clearly identifies himself/herself, finding a Core Identity and devises a blueprint to match skills, abilities, training and experience to specific criteria rather than competing with the masses. You will become familiar with terms such as "Right Fit," "Package to Pitch", "Selling Your Brand" etc. These terms come to life as you move through the process. Dr. Barro skillfully debunks the long held myths of the employer-employee relationship, and illustrates the dos and don'ts through many personal stories. She acts as the reader, poses and answers questions throughout with clarity. Using graphics, repetition and reminders, readers begin to see a new way of proceeding. The reader begins to realize the faulty assumptions. I know having read all of those vague internet HR postings that they indeed may not know whom they are looking for. Taking the best of the first ten applicants does not give you credit for your talents and it forces one to try to be "square peg in a round hole." Do you really want that? Do you really want just any old job? I dare say, in this economy, maybe yes... but not for the long term. You... are better than that. I know I am! Herein lays the opportunity and the challenge to take that vague notion and turn it into a career opportunity. Do not let the HR person deter you if do not "fit their mold." Go around them, above them, talk, talk, talk to others by phone via networking with everyone, making friends with key people that can give you the leads to potential job opportunities. I discovered Dr. Barro's book following nearly a year of intense searching in my goal to relocate to Southern California several months ago. Despite my multiple talents, I was "doing all of the right things" using traditional methods, was smart enough to spot the gimmicks, but still was one in the sea of adjective filled resumes and faxes that didn't really say who I was or what I wanted. Dr. Barro helped me see the error of my ways quickly, for she truly has written the most practical and readable book in the field. Although it is the electronic age filled with technology, the nuts and bolts of it is that you have to really communicate personally to build those relationships the old fashioned way. This includes hand written thank you notes. Yes, e-mail and internet research has its place in the process, as well as a cool media player audio customized interview if you choose, used to enhance the true you beyond the resume. However, you must distinguish yourself personally without gimmicks, or risk turning off the right people while unknowingly forging ahead impulsively on the wrong path. Can you be successful with just the book alone? I would say you can, particularly, if finances are limited. However, to experience Dr. Barro in action working personally for you and with you is worth the investment and helps immensely to further your journey. This is not a "quick fix" scenario. It takes ambition, commitment, patience creativity and a willingness to be open, as well as a positive attitude. Rome wasn't built in a day...and neither was California (my destination). Dr. Barro is personable and allows you to use the breadth of her experience to your advantage. She is easy to converse with. Her websites offer a wide array of educational resources and tutorials free of charge to keep you motivated in her quest to assist others. Her multi-dimensional role as CEO of barro global search, inc., an experienced career coach, talk show host, motivational speaker and author keeps her on the cutting edge. I am one of the fortunate few, as a Master's level professional person with a stable job in New England, however, it takes courage and lots of energy to make the needed changes in these uncertain economic times, as it does for the unemployed. Although my search is still in progress, I feel that Dr. Barro has put me on the right path to the Right Fit. She will continue to guide me to success. Dr. Barro's "Win Without Competing" leads you into the inner game of personal development with the precision of a choreographer and the wisdom of a master coach. As a human resource executive, in a critical and protracted career transition, I have engaged Dr. Barro as my coach. Our journey together has been the source of very meaningful gifts...learning how to clarify and embrace my unique career blueprint, affirming my core identity and teaching me how to identify and challenge those faulty assumptions that can get in the way of achieving continued growth and success. You owe it to yourself to read this book...just know that it evokes an inner call for the courage to take a new look at yourself and learn who you are NOW and how to find the Right Fit for the future. The result will be renewed emotional and physical energy that will enable you to play and win at your own game. It's a dog-eat-dog world. Only the fittest deserve to survive. And you can indeed win through intimidation. If anyone could be expected to attest to the above, it would be a corporate headhunter--which brings us to a new book with the unexpected title of "Win Without Competing" by Arlene Barro, Ph.D, a prominent search consultant, career coach, and educational psychologist. At first glance, the book would appear to belong in the "Warm and Fuzzy Self-Help Section" of your friendly neighborhood mega-bookstore. Well, Barro does convey warmth, but there's nothing fuzzy about her. She possesses the mien of a caring but uncompromising commander sending her clients into battle. She minces no words about the sometimes cutthroat nature of the job market; she'd be the first to warn of snakes in the tall grass. There are no mantras here, no clicking of ruby slipper heels--only solid strategy peppered with no-nonsense aphorisms. But, as implied by its title, the book is built on a fundamental paradigm shift. Barro's stated mission is to steer her readers to what she terms the "flawless fit"--the job and career for which one is uniquely suited. And when this concept is broken down to a molecular level of specificity, when a perfect DNA match is attained between the job-seeker and the job, it can be concluded with an almost scientific degree of accuracy that there is no real competition involved. The match by definition is symmetrical--not only must the individual fit the requirements of the job, but the job must fit the requirements of the individual. To know where to look for your own flawless fit, you need to know precisely what it means for you. Thus, attaining a clear-sighted understanding of your core self is the first step on the journey. This quest for self-knowledge is nothing new--witness the teachings of Lao-Tzu, the meditations of Marcus Aurelius, the writings of Thoreau. Barro stands squarely in this timeless tradition, but presents it from a modern, practical perspective. Included throughout "Win Without Competing" are revealing checklists and personal surveys she's developed in her years of coaching clients. One possible outcome of this personal assessment is the realization that you're not meant to be an employee at all--some of us, by nature, are entrepreneurs. Barro convincingly demonstrates that the principle of flawless fit also applies flawlessly in such instances. Key to the strategic aspects of job search or entrepreneurship is what Barro calls "managing the process." She presents a detailed discussion of how to take charge and avoid succumbing to the obstacles and turbulence you're bound to encounter on the road to success, covering such matters as email communications, resumes, initial discussions and final negotiations--even what kind socks not to wear to an interview (a true-life cautionary tale shows how such a seemingly minor detail can determine the difference between getting the job and not). Then Barro goes a step further and reveals a surprising reality: in many instances, the hiring company itself is unclear about what it's looking for. This presents an additional opportunity for the job-seeker to manage the process by presenting the prospective employer with options which could be to their mutual advantage. Here, as in its other sections, the book abounds with invaluable nuts and bolts advice. The final chapter extends the discussion of flawless fit to encompass personal relationships and life in general. But for the attentive reader, the entire book serves as a road map for finding one's place in the world. "Win Without Competing" is a tangible example of its own title. It's bound to be a flawless fit for anyone committed to meaningful personal success. person best suited for the job. And when I say right people or right positions, I mean perfect. Like pieces of a jigsaw puzzle that fit snuggly and smoothly together. Dr. Barro has taken the guess work out of the search. Her savvy insight in placing perfect candidates means that her goal is to achieve a match made in HR heaven. The pages of "Win Without Competing" are filled with the stories of people who have succeeded with Dr. Barro's The Right Fit Method. Her method is explained in easy to follow, bulleted pages. Dr. Barro's holds your hand throughout the process of the search, step-by-step, through her stories, her charts, her checklists. But the most fun was reading the anecdotes of real people. The bio of the author notes that Arlene Barro, Ph.D., founder and president of the executive search and coaching firm barro global search, inc., who makes her living by being an angel on behalf of sparklingly competent candidates and a breath of fresh air to the employers looking for them. the things found in career services. The focus is on differentiating yourself sufficiently so that you find the "Right-Fit" rather than engaging in endless competitive job searches. Dr. Barro's book, released in 2007, examines career management from a whole-life perspective combining a methodical approach within a holistic framework. After an overview of the "Right-Fit" way, she begins with the importance of self-assessment, then branding yourself in order to present the "fit" to potential employers. Act IV The Right-Fit Method and You. As the analysis continues, the reader develops a blueprint for approaching prospective employers and positions, providing a framework for goal setting. Using marketing analogies, Dr. Barro develops the concept of personal branding in terms of marketable transferable skills from the resume building stage through the interview and negotiating process. with concrete and specific suggestions, including: what to bring or not to bring to the interview, how to dress or present yourself, and the importance of the first impression with everyone in the company that you meet. Later chapters deal with strategies for fixing what's broken, and moving on when required. Finally, the book concludes with the application of her methodology to other areas of life. It is certainly a book that I would recommend to someone serious about their career management. "win without competing" to succeed in your professional and personal life. Dr. Barro's book is the new "Career-Seekers Bible." hire), but ultimately all that hard work pays off in a very rewarding career! Her book is a 'must have' for any career minded individual. This Doctor Makes Career Calls! I've read more than a few of these in my day and I must say that Dr. Barro's book is one of the very best. Lucid, no-nonsense advice that will help you with your career--and your life. If you're convinced that lightening will strike and you'll fall into the job of a lifetime without your having to lift a finger, then this book isn't for you. But if you live in the real world and have to depend on your intelligence, talent, and wits to get that next great job, then invest in your future: buy this book. "Win Without Competing" author Arlene Barro takes you step by step through a winning strategy for leaving the harrowing world of job competition behind. When you follow Arlene Barro's strategy you won't be wasting time looking out for the competition because you'll be too busy crafting your resume so it literally sings out your accomplishments; and preparing for winning interviews that convince employers that you are the only candidate they need to talk to. The job is yours. How does she do this? She teaches you to define your core identity--competencies, personality, and goals; develop your personal brand, pitch that brand, manage the interview process to keep it focused on how perfectly you fit into the position, and set a standard that no other candidate can compete with. And how does Arlene succeed in doing this for you? Invest in your future: buy this book and see for yourself. You've got one life to live. How much is it worth to you to succeed? The cost of a book? I am currently a college student, and am on my way to entering the world of careers. Although I don't know exactly what type of career I would like to pursue after college, this book was an excellent help in preparing me for future job hunting, resume writing, and interviewing. After I graduate, I will use this book as a reference for everything to do with my job search. Dr. Barro has a great way of directly telling the how-to's of finding a job that is right for just you. I very highly recommend it.